Natural Resource Protection: Preserve lands with valuable and vulnerable resources providing hazard mitigation and other co-benefits, including floodplains, wetlands, forest, stream systems, steep slopes, hydric and highly erodible soils, and important habitat areas. Urban Forest Enhancement and Restoration: Maintain, enhance, and restore tree canopy in urban and suburban communities to reduce stormwater runoff, ameliorate the urban heat island effect, and improve air quality. Multi-Benefit Green Stormwater Infrastructure: Retrofit developed areas to reduce impervious surface and incorporate best management practices such as bioretention areas, green streets, and green roofs in order to reduce vulnerability to flooding. 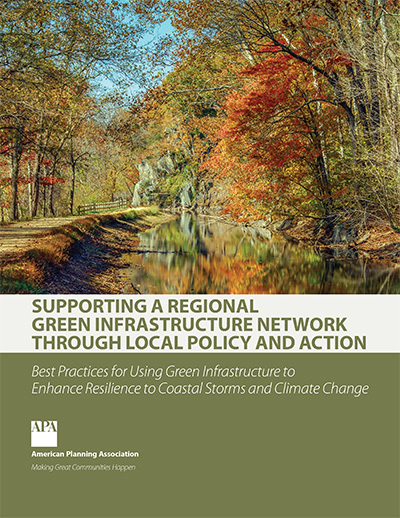 Critical Infrastructure Protection: Use green infrastructure to reduce extreme weather risks to critical infrastructure, including key transportation corridors, power production and transmission facilities, hospitals, and emergency management centers. Coastal Defense: Preserve/restore natural habitat and introduce nature-based practices (e.g., living shorelines) to protect against coastal flooding, storm surge, and sea level rise. David Morley, AICP, is a Research Program and QA Manager with the American Planning Association in Chicago, where he manages and contributes to sponsored research projects; manages the development of the Research KnowledgeBase; provides customized research assistance through the Inquiry Answer Service; develops, organizes, and participates in educational sessions and workshops; and writes for APA publications. Mr. Morley also co-edits Zoning Practice, a monthly publication to inform planners about smarter land-use practice, and PAS QuickNotes, a series of briefing papers that explain planning basics for public officials and engaged citizens. Anna Read is a co-author of the forthcoming PAS report, “Planning the Wildland-Urban Interface.' She previously worked as a Senior Program Development and Research Associate in the American Planning Association’s Washington, D.C. office, where she conducted applied research within APA's National Centers for Planning. Prior to joining APA, she worked on regional broadband planning efforts for the state of Missouri and as a project manager for the International City/County Management Association's Center for Sustainable Communities. She has a Master's degree in City and Regional Planning from Cornell University.